Economically vital to Germany since the Middle Ages, the Baltic Sea retained its importance during the Second World War. Sweden provided great quantities of high-grade iron ore, high-quality steel, ball bearings, timber, sulfur and food to Germany. But that flow of vital materials wasn’t the sea’s only value to the German war machine. As in the First World War, the German Navy built only a handful of submarines before the Second broke out. Naval strategy demanded a rapid increase in the submarine force, which meant not only a crash building submarine program but also a huge training program for the thousands of officer s and sailors who would crew these sea-going sewer pipes. Useful submarine training couldn’t take place in simulators or even in a harbor setting; the training boats had to go to sea. The Baltic Sea provided the Kriegsmarine with the perfect practice ground for its submariners, and keeping those areas safe from enemies became an even greater priority (at least in the minds of the Naval High Command) than securing commerce with the Swedes. Unlike the Imperial Navy, the Kriegsmarine didn’t station many ships permanently in the Baltic. They moved there for specific operations, performed them, and then returned to bases along the North Sea coast or later in Norway. 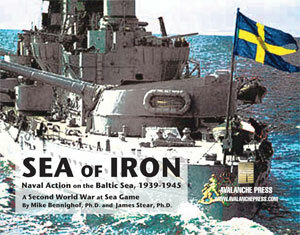 Only in the final stages of the war did major Kriegsmarine warships spend a great deal of time in the Baltic Sea. Every German warship spent at least a little time in the Baltic, for training and shakedown purposes. Tirpitz, the most powerful remaining German warship after her sister was thrown away in May 1941, went into the upper Baltic in the fall of 1941. A small fleet gathered to intercept the Soviet Baltic Fleet in case it tried to escape to internment in Sweden. As we’ve discussed elsewhere, Tirpitz’s design was an evolution of the standard German battleship going back to the König class drawn up in 1909. Following those principles, she had very good armor protection but a comparatively weak main armament. And since Germany did not introduce a true dual-purpose weapon until fairly late in the war, she had separate 5.9-inch secondary batteries to engage surface targets and 4.1-inch heavy anti-aircraft batteries. That said, she still vastly outclasses anything in the Baltic except the never-completed Sovetsky Soyuz. Scharnhorst is an even starker example of the light-armament-heavy-armor German battleship design ethos. She’s also well-protected, but carries only 11-inch guns (plans to refit her with 15-ich guns never came to fruition). While classed by the Germans as a battleship, her design is from a different lineage than that of Tirpitz; Scharnhorst is really an enlarged pocket battleship with a third gun turret, more conventional turbine propulsion, and much superior protection. Both ships have appeared in earlier games (Bismarck and Arctic Convoy); the drawings have been replaced with new ones for Sea of Iron. Finally, dedicated Second World War at Sea players get to play with the two ancient German pre-dreadnoughts Schlesien and Schleswig-Holstein. Following the First World War, all German dreadnoughts were either scuttled at Scapa Flow or seized by the victorious Allies. Weimar Germany’s fleet was left with a collection of elderly pre-dreadnoughts and old cruisers, suitable for coastal defense and little more. One by one the old battleships went to the breakers, with two soldiering on as cadet training ships, their boilers and weaponry reduced to make room for more accommodation space. Not considered at all useful by 1939, they participated in the attack on Poland anyway, with Schleswig-Holstein famously firing the war’s first shots. Schlesien joined her in bombarding the Polish fortress on the Hel Peninsula, and later would land troops in Copenhagen during the occupation of Denmark. The two old tubs carried between 12 and 14 5.9-inch secondary guns during their service with the post-war Reichsmarine, but these were steadily removed during the 1930’s with the last going ashore in 1939. In return they received a half-dozen 105mm anti-aircraft guns and a number of light flak pieces that increased as the war went on. Schlesien received new oil-fired boilers in 1938, in order to increase the barracks and instruction space available in her school-ship role; Schleswig-Holstein remained a coal-burner but had had special oil sprays fitted during the First World War to help ignite the low-quality coal available during wartime. Neither survived the war, falling victim to air attacks during the last weeks of the conflict. The Soviets raised the hulk after the war and towed it back to Tallinn as a prize (a captured German battleship, even an ancient one, had a certain prestige value). They later beached the wreck and used it as a target for a few years before cutting up the remains for scrap. Two “pocket battleships,” more properly termed armored cruisers, show up in the Baltic, joining Tirpitz to hunt for the Soviet fleet and later to provide fire support to the retreating German armies. Admiral Scheer and Lützow are heavy cruisers with 11-inch guns. While their pieces show very similar “above water” capabilities to the new-model Swedish coast-defense ships (the Swedes have no torpedo factor or airplane, but heavier anti-aircraft), their protection is far less impressive. Built for commerce raiding, the armored cruisers are out of place in the Baltic, where they have to act as actual cruisers or small battleships. Their diesel power plants give them enormous range, which is of little value in the Baltic, where they’re usually called on to serve as floating heavy artillery batteries and are only somewhat more effective in that role than the two ancient training battleships. But that’s what the Germans have, so a German player will just have to make do. The one true heavy cruiser the Germans do have, Prinz Eugen, is a capable ship and like the battleships is built along the old Imperial theory of maximum protection at the expense of armament. She makes most of her appearances during the last year of the war, and would be the largest German ship to survive the conflict. She’s more powerful than the Soviet “heavy” cruisers with their 7.1-inch guns or the projected Swedish ships with just six 8-inch guns, but seriously out-gunned by the American-built heavy cruisers the Swedes tried to buy just before the war. As with the battleships, the armored cruisers and Prinz Eugen have appeared in other games before. We’ve replaced their drawings as well.